Chair and revolving small armchair with a soft and refi ned shape. The backrest and the seat are padded and the upholstery is in a removable fabric available in different colours. Legs in natural or black ash tinted. 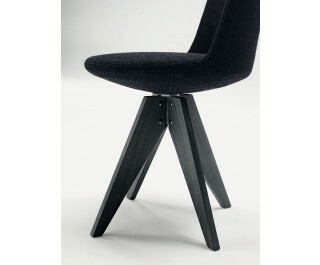 The attention to detail, the quality of the materials and the balanced proportions make it an important chair, particularly suitable for the domestic environment. The seat is EN 1022 certified.